The last thing our plumbers use is guess work or just plain old brute force when working on any plumbing issue on your home or business property. In fact we approach the problem more like a team of surgeons than a crowd of cowboys and use a combination of cutting edge tools combined with decades of plumbing experience to set your plumbing problems right. Our primary focus at ADI is obviously on providing the best plumbing service possible but we do also provide our customers with a power flushing and leak detection service if they require these. This process uses a low pressure but high velocity water stream to remove any dirt, debris or limescale that’s built up inside your heating system or plumbing pipes. Having blockages in these means your heating system is working harder to provide the same amount of heat and is costing you more money as a result. Not all water leaks are as obvious as we’d like them to be and they stay hidden but still cause you problems with dampness or mould. Our leak detection equipment means we can track down even the most awkward of leaks no matter where it’s hidden on your property. And we can find these leaks without having to dig or drill, in fact our engineers can find the problem to within 5cm of the actual source. 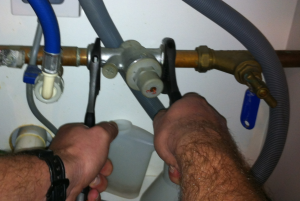 Assistance from the very best plumbing service in West Sussex is just a single phone call away now on 0800 731 3848.